Friday night at the football game the 18 GMB seniors will be recognized at halftime. Please come out and cheer on the band and color guard at their last game of the season. Parents of seniors and seniors please don’t forget to be at the school by 4 for your special photo session. Guess what! Butterbraids are back and this fundraiser is for ALL the instrumental music programs at Rocky Mountain High School. They will be delivered just in time for the holidays. Information will be sent home with students this week at school. See attached just in case it never makes it out of their backpack 😊. This Saturday GMB competes in its first competition of the year. 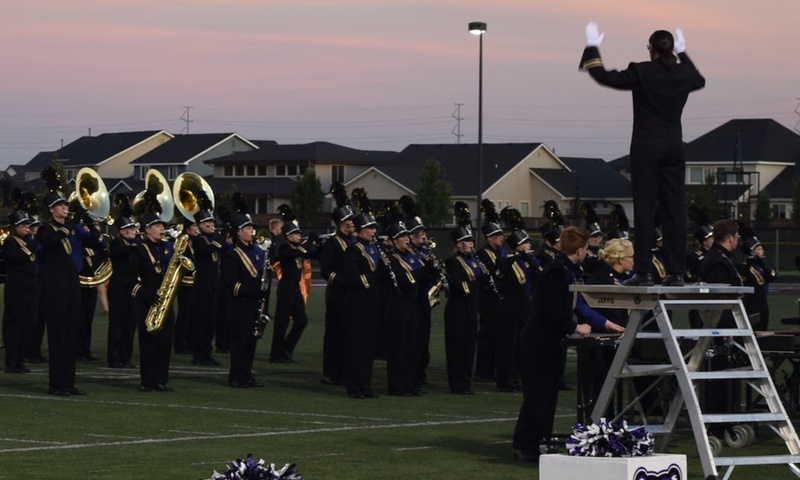 Here’s a photo of the band from last year getting ready to take the field for competition & the schedule for the band on Saturday. Thank you to everyone who attended the first orchestra concert of the year on Tuesday. We’re off to a great start! Orchestras ensembles: don’t forget about the picnic this Saturday 9/16/17 from 12:00-2:00 pm. The event will be at Eagle Island Park. Hot dogs will be provided; bring something to share. The first orchestra concert is Tuesday, September 12th at 7:00 p.m. It will be located in the RMHS Auditorium with a parent meeting afterwards.